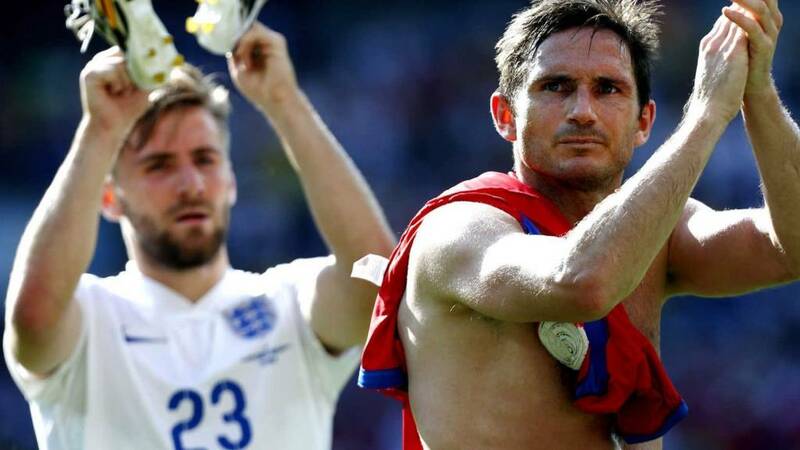 GET INVOLVED: Will Lampard go down as an England great? And so it is time for Sportsday to close down the doors for today, but they will re-open on Wednesday at 08:00 BST so please join us then. But until the morning, in the words of our Coronation Street neighbour Jim McDonald, cheerio now. launched his live text, which will keep you up to date with all the League Cup matches being played tonight. A reminder that 5 live Sport with Mark Chapman begins in 40 minutes and features live commentary of the League Cup match between MK Dons and Manchester United. Now down at The New Den tonight we have Millwall, ninth in the Championship, against Southampton, who lost all those players - and a manager - to other teams in the close season, and currently lie 14th in the top flight. Saints drew 0-0 with West Brom and have scored only the one goal in their two league games thus far. This is the third time they have been drawn together in the League Cup and the Lions have won just one of their last 12 matches against Southampton in all competitions. Many thanks for your comments following Frank Lampard's international retirement. A mixed bag I think it's fair to conclude, a bit like his international career one could say. Dean Storey: Devastated about Lampard!! Deserved captaincy of England years ago! Quality stats for a midfielder! Kintu: I think it's the right time for him to retire. I don't think he will go down as an English great, but his contribution should be noted. Amzod: The Lampard/Gerrard problem has finally been solved...they've both retired. 5-3 win over Charlton. Was he booked then for taking his shirt off though? A selection of your Facebook comments on whether Frank Lampard should be considered an England great. Ross Palgrave: For Chelsea, yes but England no. The last legend England had was Alan Shearer in my opinion. England, as a team have achieved nothing since Euro 96. Matt Simper: Sadly not a legend. He goes down with Beckham, Gerrard, Ferdinand, Owen, Terry etc. as one that promised so much, yet never truly delivered. Sri Lanka have levelled their one-day international series with Pakistan after winning by 77 runs in Hambantota. Mahela Jayawardene (pictured) made 67 and skipper Angelo Mathews 93 as Sri Lanka posted 310-9 and then bowled out Pakistan for 233 in the 44th over. The deciding match takes place in Dambulla on Saturday. The third match takes place on Saturday, with coverage again starting at 10:15 BST, while on Sunday there is commentary from the Rose match between Lancashire and Yorkshire in the County Championship. Jamaican sprint superstar Usain Bolt will make his first trip to India next week to play cricket against India all-rounder Yuvraj Singh. The format and details of the game have not been revealed but Bolt, 28, who at 6ft 5in matches the build of a classic West Indian fast bowler, has expressed a future desire to play in the Indian Premier League. Celtic are hopeful of finally concluding the loan signing of Wakaso Mubarak on Wednesday, BBC Scotland understands. The one-year deal to bring the 24-year-old Ghanaian winger from Rubin Kazan has been held up for over a week by visa and work-permit issues. Those appear to be close to being resolved and the player could sign tomorrow. Discussions are continuing with Serbian striker Stefan Scepovic over a permanent move from Sporting Gijon. Kent's match against New Zealand A is abandoned without a ball bowled because of rain at Canterbury. At Priestfield Stadium, Newcastle are the visitors to play Gillingham, 18th in League One. The two sides have only met once before, in a League Cup second-round tie in January 1977 when the Magpies won 2-1. The form book is going to have to catapult out of the window for a shock to occur given these stats at out disposal. The Gills have gone 13 League Cup games without a clean sheet and last made it into the third round of the League Cup in 2005. There are 20 Capital One Cup second-round matches taking place tonight, nine involving Premier League teams. Our live text will begin at 18:30 BST and there is live commentary of MK Dons against Manchester United in tonight's 5 live Sport with Mark Chapman from 19:00 BST. Colin Gray: I'm a Scotland supporter but must say that Frank was a loyal & good servant to England, I always enjoyed watching him play whether for country or club! Stuart Cunliffe: Not an England great unless a major tournament is won - promised so much with Terry, Gerrard et al but always fell short. Tom Peters: Lampard's commitment to England has been up there with the best. But, like so many England players, never reached the performance levels on the international stage. John Degenkolb wins stage four of the Vuelta a Espana, with Australian Michael Matthews of the Orica team retaining the overall lead. The Pakistan Cricket Board has abandoned plans for a Pakistan Super League Twenty20 event in the United Arab Emirates in January next year due a lack of time to schedule the tournament ahead of the World Cup. Britain's dressage riders have won the first medal for GB at the 2014 World Equestrian Games in Normandy, France. The team of Charlotte Dujardin, Carl Hester, Michael Eilberg and Gareth Hughes out-performed predictions to beat Netherlands and come second to Germany. Individual Olympic and European champion Charlotte Dujardin was last to go for GB, needing to score over 81.329% to secure silver for team. She scored 85.271%. As if that wasn't exciting enough, Fulham are poised to complete the signing of Hungarian goalkeeper Gabor Kiraly from 1860 Munich. 38-year-old Kiraly previously played for Aston Villa and Burnley. And yes, he still wears tracksuit bottoms. Bayern Munich on Twitter: DONE DEAL: FCBayern and ASRoma have agreed the transfer of MEHDI BENATIA (27)! Defensive ace set to sign a 5-year contract. British number 1 Heather Watson is in trouble in her first-round match at the US Open. She has lost the first set 6-1 to Romania's Sorana Cirstea. follow that match live with the live text commentary stylings of our colleague Aimee Lewis. set to miss the start of the season after undergoing knee surgery in May. Nowell started every game of England's Six Nations campaign but was forced to sit out the summer tour of New Zealand. The Daily Express are both reporting that Angel Di Maria has passed his medical at Manchester United. Luol Deng admits he does not know what the future holds for British basketball and thinks funding cuts have left the sport at the point of no return. Asked if the sport was close to folding in the UK, he said: "We are very close. At this point I don't know what is next, we just have to wait and see what the plan is." Japan's Masashi Ebinuma and Kosovar Majlinda Kelmendi both successfully defended their world titles at the World Judo Championships. Alex J Bronsdon: Lampard is the ultimate England player - he was able to score goals and had honour and pride to play in an England shirt. Paul Sullivan: None of the last generation can call themselves great for England they won it all for clubs nothing for country. Steve Ward: Remember only 22 players have ever 'won anything' with England, but there were many better players who didn't. "Frank Lampard has been a superb representative of the English game, both as a player on the pitch and an ambassador off it. To reach in excess of 100 international caps is something very few professionals achieve and he is in exalted company. "He has served the national team quite brilliantly during his 15-year international career. It is with regret that I accept and understand the decision he's made." Arsenal manager Arsene Wenger believes Alex Oxlade-Chamberlain can become a "world class" wide player like David Beckham and Zinedine Zidane. Ahead of Arsenal's Champions League clash with Besiktas, versatile midfielder Oxlade-Chamberlain admitted he enjoyed playing in the centre of the park. But Wenger responded: "Beckham and Zidane played on the flanks and they turned out to be world-class players. Alex can be the same." BBC Sport website live text with the intrepid Aimee Lewis now. told BBC Sport yesterday that England cannot win next year's World Cup and are "far behind" other teams. Root, speaking after net practice for Wednesday's second one-day international with India in Cardiff, says Swann is "paid to give his opinions, and he is entitled to give those", but believes England are in a "very good place". Salford forward Steve Rapira has returned to New Zealand on compassionate leave. The 25-year-old, who joined the Red Devils on a two-year contract from New Zealand Warriors last September, has been an ever-present since Iestyn Harris took over as head coach in April. This is shaping up to be a busy day for Samuel Eto'o. As the 33-year-old striker waits for his move to Everton to go through, he's received news that he's been stripped of the captaincy of his national side Cameroon. left out of the squad earlier this week following a poor World Cup campaign. Former QPR midfielder Stephane Mbia, now with Sevilla, replaces him as skipper. Stuart Hall (not that one): Lampard not a great, but will be remembered for that goal that wasn't, which made Fifa decide to bring in GLT. Mike Hale: He has always put in 100% and unlike some players, was so proud to represent England. Martin Murison: Gerrard and Lampard retiring within the same month, think England just lost their deadwood. Ivory Coast will not be allowed to host their African Nations Cup qualifier next week against Sierra Leone in Abidjan because of fears over the Ebola virus, according to reports. Chelsea midfielder Marco van Ginkel is to seek crisis talks with Jose Mourinho as AC Milan wait in the wings to take the Dutchman on loan, according to Italian media. Sky Sport Italia are reporting that the Italian club have expressed an interest in Van Ginkel after the midfielder was told his wish for regular first-team football this season would not be granted. Stoke manager Mark Hughes has doubts over striker Bojan Krkic (rib) and defender Phil Bardsley (knee) ahead of his side's Capital One Cup encounter with Portsmouth on Wednesday. Liberty National golf course in New Jersey has been chosen as the venue for the 2017 Presidents Cup. The course was opened in 2006 and hosted the Barclays PGA Tour event, part of the FedEx Cup play-offs, in 2009 and 2013. Bangladesh all-rounder Shakib Al Hasan's six-month ban imposed last month for "misbehaviour" has been lifted, the Bangladesh Cricket Board said. The 27-year-old was banned for what the BCB called a "severe attitude problem". One midfielder who won't be going anywhere this transfer window is Barcelona enforcer Javier Mascherano. The Argentine has just penned a new four-year deal at the Nou Camp. "I am very happy to continue at this great club and to share the dressing room with great players," he told the club's official website. Bundesliga club Hamburg are weighing up a move for Spurs midfielder Lewis Holtby, German paper Hamburger Abendblatt reports. Hamburg are looking into options to replace Rafael van der Vaart, who has been linked with a possible move to QPR as well as clubs in Turkey. The 23-year-old spent the second half of last season on loan at Fulham after falling out of favour under both Andre Villas-Boas and Tim Sherwood. Wakefield forward Taulima Tautai will be Wigan's only recruit for 2015, coach Shaun Wane has confirmed. Shay Given could make his first competitive appearance for Aston Villa since January 2013 when they host Leyton Orient in the Capital One Cup on Wednesday. Christian Benteke (Achilles) and Libor Kozak (broken leg) are still unavailable but Joe Cole is expected make his full debut against the League One side. Ron Vlaar (knee) and Aly Cissokho (ankle) are not expected to be risked. Roma defender Mehdi Benatia was heavily linked with a move to Manchester United earlier this summer, but now it looks like the Moroccan could be on his way to Bayern Munich. Sky Sport Italia is reporting that the centre-back will have a medical in Germany tomorrow before signing a five-year deal with Bayern for an initial fee of €26million (£20.7m). Gary Lineker on Twitter: Frank Lampard retires from international football. A fine player, an outstanding finisher and a credit to the game of football. Peter Reid on Twitter: Some goal scoring record Frank Lampard from the middle of the park. Brilliant. Tristan: At club level yes, but since England didn't accomplish anything with him and many others, you can't call him an England great. Dan Rogers: Lampard has to go down as a great because he is a complete midfielder and the only player to play for Chelsea that everyone likes. Dean Faccini: Lampard is not an 'England great'. To say so would devalue the achievements of those who have been worthy of such an accolade. An impressive batting performance from Sri Lanka in the second one-day international against Pakistan at Hambantota as they post an imposing total of 310-9..
Angelo Mathews top-scored with 93 while Thisara Perera bludgeoned 65 off 36 balls as the hosts racked up 101 runs in the last 10 overs. Pakistan won the opening match on Saturday by four wickets. Earlier on today we asked you to name the nine Swedish golfers that have represented Europe at the Ryder Cup. The answers were Fasth, Fulke, Haeggman, Hanson, Johansson, Karlsson, Parnevik, Sandelin and Stenson. Give yourself a massive pat on the back if you got all nine of those. Moving away from Frank Lampard for a moment, some news from the world of boxing to bring you. Britain's Scott Quigg will defend his WBA World Super Bantamweight title against Belgium's Stephane Jamoye in Manchester on September 13. Quigg won the world title against felllow Briton Rendall Munroe in 2012. Kye Merkett: There hasn't been an England great for a very, very long time. Samuel Deano: If Lampard isn't a England great, then there hasn't been an England great since 66. Former England and Liverpool defender Phil Thompson tells Sky Sports: "I think we'll remember him as a stellar performer. He's been a real credit in the way he's played his football, and a great man to have around in the dressing room." Opta Joe on Twitter has a typically pithy epitaph for Lampard's England career: "40 - Frank Lampard has hit more World Cup shots without being credited with a goal than any other player (1966-2014). Denied." What do you make of that then? Lampard retires as England's sixth most capped player, and his return of 29 goals is a excellent one for a midfielder. But how badly will he be missed by Roy Hodgson's side? Lampard enjoyed plenty of high points in an England shirt, notably an outstanding Euro 2004 tournament where he was arguably his country's best player. But like many others, his career was ultimately one of disappointment on the biggest stage and he will be remembered as part of an 'golden generation' that never quite lived up to its promise. "Due to my club career now going in a different direction it is of utmost importance for me to consider my family first. Also, to concentrate on how I can perform consistently to the best of my abilities over my next few years in club football." The 36-year-old earned 106 caps over a 15-year international career. He said in a statement released by his management company: "I have taken the decision to retire from international football. It has been a very tough decision for me to make which is why I have given it so much thought since the World Cup." Midfielder Frank Lampard announces his retirement from England duty. Plenty of talk about Angel Di Maria of course, but his new team Manchester United are in action tonight, not at the Nou Camp or the Bernabeu but the Stadium MK in Milton Keynes in round two of the Capital One Cup. Tonight's 5 live Sport with Mark Chapman from 19:00 BST features live commentary of the MK Dons against United, kick off at 20:00 BST. won by 10 wickets at Trent Bridge. They went on to win that one-day international series 4-0. BBC Sport Facebook page as we ask if Angel Di Maria will prove worthy of the record British transfer fee. Dale Duncan Richards: We started last game with Fletcher, Cleverley and Young. Signing Mr Bean would have been an improvement. Gavin Davids Kim: My predictions are that he will be a great signing. He will inject back the speed that United lacked following the departure of Ronaldo. Neil Hodgkinson: As a lifelong United fan, I must admit we've been made to look like fools yet again, held to ransom isn't the word. Crystal Palace goalkeeper Julian Speroni insists the squad want caretaker boss Keith Millen to remain with the club. "We know Keith very well and respect him a lot," he says. "If he does not get the job, who better to help the new man who comes in? He knows the players and the whole club inside out." Hamilton claimed Rosberg had admitted to instigating. "Whatever the case I will always put the team first and I won't take anything into my own hands," said Hamilton, who now trails the German by 29 points. Asked whether he could trust Rosberg should they be wheel-to-wheel at the next race in Italy on 7 September, Hamilton said: "I'll have to make sure we're not wheel-to-wheel." QPR face Burton Albion in Wednesday's Capital One Cup second round and boss Harry Redknapp expects a drastic improvement from his players following Sunday's 4-0 thrashing at Spurs. "We lacked energy and I was disappointed with that aspect of our play," he told the club's website. "There was no urgency or intensity to our game and that's not good enough." Andy Murray's thoughts on his fitness problems in Monday's first-round US Open win over Robin Haase. Former Arsenal striker Nicklas Bendtner has been left out of Denmark's squad for their upcoming Euro 2016 qualifier against Armenia. However, Leicester City keeper Kasper Schmeichel, Liverpool defender Daniel Agger and Spurs midfielder Christian Eriksen all make the cut. Arsenal boss Arsene Wenger confirms Olivier Giroud will miss Wednesday's Champions League play-off second leg with Besiktas but adds: "After that, we don't know how long he will be out for. It's sad for us. "Olivier will see a specialist, then we'll make an announcement of how long he'll be out." DestinationNewYork: The guy has been the best player in Europe for the past two seasons, he will be a hit. Karan: Di Maria won't flop but his team-mates will and that will reflect badly on him. Stephen: Much better than Fabregas, Sanchez or even Balotelli. Former Brighton boss Oscar Garcia has left his job at Israeli club Maccabi Tel Aviv because of the "current security situation" in the country. Garcia is set to be replaced by former Liverpool assistant coach Pako Ayestaran. Garcia has been linked with the manager's job at Fulham should current coach Felix Magath be relieved of his duties. after a meeting on Sunday. Ebosse, who was 24, was struck on the head when leaving the pitch after his side JS Kabylie's home defeat by USM Alger in Tizi Ouzou on Saturday. Fulham owner Shahid Khan gives the infamous vote of confidence to under-fire manager Felix Magath and says the German is the "ideal" man to lead them back to the Premier League. Results so far don't exactly support this view, Fulham are bottom of the Championship table with no points from four matches. French paper L'Equipe are reporting that Spurs have joined the long queue of clubs interested in PSG midfielder Adrien Rabiot. PSG want around £8m for the 19-year-old. L'Equipe are also reporting that Tottenham are now firmly in contention for Alex Song, the Barcelona midfielder who is also interesting Marseille. Liverpool's new signing Mario Balotelli bids an emotional farewell to AC Milan, for whom he scored 30 goals in 54 games after signing from Manchester City in January 2013, and tells their official website: "I am about to begin a new chapter but first I have to thank Milan fans that have always shown incredible loyalty and great trust in me. "The biggest thank you goes to my team-mates, who have put up with me on and off the pitch, as only my family are able to do. I will always appreciate your camaraderie, I have learned so much from all of you." German capital Berlin will unveil its concept for the 2024 Olympics on a 1 September, Mayor Klaus Wowereit has announced. No official candidate city for the 2024 Games has yet been chosen, and Germany still has to decide between Berlin and Hamburg, which has also expressed an interest. Bidding for the 2024 Games starts next year, with a decision to be made in 2017. Other prospective hosts include Los Angeles and Boston, as well as Paris, Istanbul, Qatar's Doha and Durban in South Africa. available from 5 live is Robbie Savage labelling the Manchester United team against Sunderland as their worst ever in the Premier League. The Guinea-Bissau international is not in Ronny Deila's first-team plans, and a loan move looks likely. BBC Sport Google + page regarding Manchester United's British record signing of Angel Di Maria. Brian Lavery: I always welcome good new signings. However I cannot help wondering that perhaps the astronomical fee could have been spent better - surely a winger right is not our main requirement? Rob Wasteney: I'm not sure that he addresses Man United's weaknesses. That said he will allow a wider array of attacking formations. Midfielder Steven Pienaar has been ruled out of Everton's Premier League clash with Chelsea on Saturday because of groin trouble, but manager Roberto Martinez remains optimistic Romelu Lukaku and Darron Gibson will be fit to play. Disappointment for Aston Villa striker Andreas Weimann as he's left out of Austria's squad for next month's European Championship qualifier against Sweden. Weimann scored the winner in Villa's opening day win at Stoke, but he's overlooked in favour of 1860 Munich striker Rubin Okotie, who wins his first call-up in five years. Here is today's question and the subject is golf. Who are the nine Swedish golfers that have represented Europe at the Ryder Cup? Answers later this afternoon. Ostersund chairman Daniel Kindberg has said: "It is a great achievement for Modou and of course for our entire club that a player goes to a team in the world's best soccer league, the Premier League. It is sensational." cricket download available as Vic Marks, Graeme Swann and Michael Vaughan review England's prospects and pick their teams for the 2015 Cricket World Cup in New Zealand. Martin Whitmarsh has officially parted company with McLaren after more than 24 years of service. Whitmarsh served as head of operations, managing director and F1 CEO during his time with the organisation before taking on the role of team principal in 2009.
the Yorkshire Evening Post reports. The Blades are keen to boost their defensive ranks following the departure of Harry Maguire to Hull City, and Nigel Clough says Pearce is top of his wish-list. In case you missed it yesterday, Leeds have also signed the superbly named Danish international Casper Sloth in a £600,000 deal. The French defender spent the second half of last season on loan at Fiorentina in Italy, but apparently he has no shortage of other exit routes. "Diakite has got 10 options," said manager Gus Poyet. "The problem is managing them because he has got his priorities as well." 1-0 defeat in the away leg. "The mistakes made by the Belgian police should not be repeated by our local force and Lokeren fans should not have their experience of football in this country soured by heavy-handed policing," the group says. Ronald Koeman is eying up a move for Atletico Madrid defender Toby Alderweireld. The 25-year-old is also wanted by Monaco, but the Mail says Southampton are confident of beating the French club to a deal for the Belgian. Saints are also reportedly interested in a move for Feyenoord midfielder Jordy Clasie. Donovan Mark Phipps: He's a good signing. He was Argentina's best player in the World Cup in my opinion. He was the one creating things. He did more work than even Messi. It's looking increasingly likely that Michael Dawson is going to complete a move from Tottenham Hotspur to Hull. Spurs have been strongly linked with a move for Sevilla centre-back Federico Fazio, and now Sky Sports are reporting that Dawson is having a medical at Hull City. FA website this morning Swansea boss Garry Monk has acknowledged Tom Carroll's similarity to Luka Modric after the Tottenham midfielder joined the Welsh club on a season-long loan. Sherwood to replace Harry at QPR? Tim Sherwood has been identified as a potential replacement for Redknapp. QPR are closing in on Liverpool youngster Jack Robinson in a bid to solve their left-back problem. Indian boxer Vijender Singh, the 2008 Olympic bronze medallist, will not defend his middleweight title at next month's Asian Games in Incheon, South Korea, because of an injury to his left hand. Gunners get Carvalho on the cheap? Arsenal could land Sporting Lisbon midfielder William Carvalho on a cut-price deal, Italian paper Tutto Mercato are reporting. But there's a catch - the Gunners would have to loan the Portuguese enforcer back to Sporting for a season. Daily Express say Louis van Gaal wants Blind and Arturo Vidal to follow Angel Di Maria to Old Trafford in a £52m double deal. Not content with signing a mere £150m worth of talent so far this summer, Barcelona are apparently closing in on a seventh acquisition. The latest man in their sights, according to Catalonia-based daily Sport, is Sao Paulo full-back Douglas. The 24-year-old Brazilian should cost around £5m. Sound the transfer gong! We have our first done deal of the day, as Brighton complete the signing of Aston Villa midfielder Gary Gardner on loan until January. The 22-year-old has suffered two serious knee injures while at Villa and was on loan at Sheffield Wednesday last season. tells Talksport Manchester United have not been in contact with Ajax regarding a deal for the 24-year-old. Could salvation be at hand for perennial Liverpool benchwarmer Sebastian Coates? The Daily Star are reporting that the Uruguayan is a loan target for Sunderland manager Gus Poyet. But there's a twist: if Coates does join the Black Cats, manager Gus Poyet would have to finally give up on landing his Anfield team-mate Fabio Borini or buy the Italian outright. Sky Sports are reporting that Werder Bremen, who had been the leading candidates to sign him, have now withdrawn their interest. That means Fulham could be stuck with Ruiz, but given the striker's influential displays at the World Cup and Fulham's dire performances so far this season, that may not be bad news for manager Felix Magath. Christopher Clewes: As a long time Man Utd fan I believe Di Maria could be the injection of class that we need this season. Jacob Baglow: Too much money, not what United need. Nicholas Wong: Angel Di Maria can't be a flop given his quality, but can he shine really depends on how LVG uses him. Sunderland boss Gus Poyet will make changes for Wednesday night's Capital One second-round trip to Birmingham. Goalkeeper Costel Pantilimon, defender Billy Jones, who has shaken off a hamstring problem, and midfielder Jordi Gomez are in line to play. Football Daily download there is reaction from Brendan Rodgers on a disappointing Liverpool performance at Manchester City and Robbie Savage gives his thoughts after Manchester United break the transfer record to sign Angel Di Maria. The Liverpool Echo are reporting more bad news for Brendan Rodgers after last night's chastening defeat by Manchester City. According to the paper, full-backs Glen Johnson and Alberto Moreno picked up knocks and both could be sidelined for Sunday's Premier League encounter with Tottenham. Northamptonshire will release former captain Andrew Hall and all-rounder Matt Spriegel at the end of the season. Former South Africa international Hall, now 39, joined the county in 2007 and captained the team between 2010 and 2012. Spriegel joined Northants from Surrey in 2012 and played every match of the team's successful Twenty20 campaign the following year. Greg O'Keeffe on Twitter: Samuel Eto'o is a goer. Joining Everton this week. Unlikely Daniel Welbeck will be joining him at Goodison however either on loan or permanently. Wolves are closing in on the signature of Chelsea starlet George Saville. The Midlands side have apparently beaten off competition from Middlesbrough for his services. The 21-year-old knows Wolves boss Kenny Jackett well from a brief spell on loan at Millwall. Daily Star reports that the Gunners are being linked with 27-year-old Torino forward Alessio Cerci. Plenty of interesting football stories in the regional press this morning, as well. Louis Van Gaal is banking on Di Maria to have a similar effect to Arjen Robben at his former club Bayern Munich. Van Gaal is planning to hand an outing to several of the Red Devils' fringe players in tonight's League Cup clash with MK Dons. Shinji Kagawa and Danny Welbeck are among those who could get a run-out. 4-0 win against Bolton to put them top of the then Premiership table. The French have such a poetic way of expressing themselves, don't they? Not for them the nitty-gritty of transfer machinations; instead, sports daily L'Equipe loftily says Ligue 1 clubs have "seven days left to dream" before the window closes. Among the deals which L'Equipe is dreaming of is a potential move for Alex Song. The former Arsenal man has been linked with a move back to the Premier League this summer, but L'Equipe reports that he could be on his way to Olympique de Marseille. There's also a look at Roger Federer, who is bidding for an 18th Grand Slam title at the US Open. The Swiss enters the tournament in excellent form after a strong hard-court season, and the paper hails his "Operation Resurrection". Didn't really need me to translate that one, did you? Andrew Forbes: Di Maria is exactly the player Man Utd need! Brings all sorts of class with him to old Trafford. Jim Atkins: Don't understand why Utd want Di Maria. He's good but we don't need a winger, we need a Vidal/Guarin and a Benatia. Raymond: Energetic and relentless Angel Di Maria will be a great signing for Man Utd, he is a great box to box winger. Meanwhile, Spanish sports daily Marca leads on an unconvincing start for Real Madrid in their La Liga campaign. Los Blancos overcame newly promoted Cordoba 2-0, but they had to wait for a late goal from Cristiano Ronaldo to make the game safe. The paper says Real needed Ronaldo's "fire-fighting" against a "valiant Cordoba". Marca also mentions the eight-match ban meted out to Atletico Madrid boss Diego Simeone for his antics in the Spanish Super Copa. He will miss four La Liga matches. After that full English round-up of today's sport stories, here's a little Continental breakfast for you. We begin with Italy's Corriere dello Sport, which leads on a story that may interest Arsenal fans. The Gunners have been heavily linked with a move for Olympiakos centre-back Kostas Manolas, but Corriere says that the Greek is on his way to Roma instead. Sevilla goalkeeper Beto will be sidelined for a month with a second degree muscle tear in his left leg sustained in Saturday's Primera Division draw against Valencia. A total of 41 team bases which will host the 20 participating teams during the 2015 World Cup in England and in Cardiff between 18 September and 31 October next year. England will use their customary Pennyhill Park location in Surrey but will base themselves in Salford for their final Pool A match on 10 October at the Manchester City Stadium. Torres and Townsend in limbo? The Metro says that AC Milan have contacted Chelsea over a potential loan move for striker Fernando Torres. The Telegraph says that winger Andros Townsend has been caught in the middle of a transfer stand-off between Southampton and Tottenham that could leave him on the fringes at White Hart Lane. the Mirror says that Spurs could land Sevilla centre-back Federico Fazio for £8m. Arsenal's 2-2 draw with Everton on Saturday. "There has been no approach from either of those clubs," he said. "The only certainty is that Lukas has a contract with Arsenal." hails the rejuvenation of Stevan Jovetic, no more than a bit-part player for Manchester City last season, but a two-goal hero in last night's win over Liverpool. The Montenegrin struck twice to "break Kop hearts", the paper says. "could turn to Danny Welbeck or Loic Remy" as they look to secure a bit of cover up front. Meanwhile, the i reveals that Di Maria may not be the only big name yet to be crossed off the Old Trafford shopping list. a £34m deal for the Chilean in prospect. He also says a move for Ajax's Daley Blind is not out of the question. The paper also says that Mercedes are considering action against Nico Rosberg for his role in the crash with Lewis Hamilton in Sunday's Belgian Grand Prix. A look at some of this morning's back pages for you now, and we begin with the Daily Express, who are in no doubt about the significance of Manchester City's victory over Liverpool last night. says City showed their "champion pedigree", hailing "a stunning marker in this season's first clash of the Premier League giants". The Express also reveals that Angel Di Maria has jetted into Manchester ahead of that expected big move to Old Trafford. yesterday's four-set win over Dutchman Robin Haase at the US Open. says his "body failed him", and admitted he "panicked" as Haase threatened a comeback. But Murray came through safely in the end, 6-3 7-6 (8-6) 1-6 7-5, and booked himself a second-round meeting with Germany's Matthias Bachinger. Novak Djokovic and Maria Sharapova are also safely through at Flushing Meadows after comfortbale wins overnight. Giroud awakening for the Gunners? But while Manchester United and Everton are lining up impressive reinforcements, and Manchester City are discovering strength in depth they never knew they had, spare a thought for poor old Arsenal, who are digesting the news that their most reliable goalscorer could be sidelined for up to three months. the club are waiting on the results of a second scan amid fears that he may have broken an ankle. With Giroud on the treatment table and Alexis Sanchez less than impressive in the centre-forward role on Saturday, suddenly the Gunners are looking thinner up top than Jonjo Shelvey. Could Arsene Wenger be tempted back into the transfer market? And Manchester United aren't the only team who are digging into their back pockets to find the player who could give them that crucial boost in this Premier League campaign. Everton were hugely impressive last season, and they've already added bustling Belgian centre-forward Romelu Lukaku on a permanent deal. looks set to bring in veteran Cameroonian goal-poacher Samuel Eto'o to bolster the Toffees attack. We'll be keeping you updated with any news on that deal too. Manchester United agreed a British record £59.7m fee for his services. Di Maria is apparently in the country so a deal looks very close, and we will of course endeavour to keep you updated with the latest developments on that one throughout the day. reckons Di Maria can thrive as United's main man, but what do you reckon? We want to hear from you throughout the day, so let us know whether you think Di Maria will be a key weapon in the title race, or an expensive flop. Tweet us at #bbcsportsday or text us on 81111. Mario Balotelli has joined the Reds in a £16m deal and watched last night's match from the stands - clad in what I'm sure you'll agree is a very fetching scarf-and-bandana combo. admits signing the volatile striker is a 'risk' for Liverpool. Question is, will the risk pay off? Last night saw the first heavyweight clash of the Premier League contenders, and it was defending champions Manchester City who landed the first psychological blow of this season's title fight. an impressive 3-1 win as Stevan Jovetic banished memories of an ineffectual debut season with a fine two-goal performance, and Sergio Aguero did his best Ole Gunnar Solskjaer impression and scored with his first touch. Hello and welcome to to Sportsday on what looks set to be another action-packed day in the transfer window...and beyond. Plenty to get through today as we await news of Angel Di Maria and Samuel Eto'o's impending moves, look back at Manchester City's 3-1 win over Liverpool last night, and keep you abreast of all the latest breaking gossip. So sit back and let Sportsday be your whistlestop guide for all things football-related.